Chord Electronics is pleased to announce the latest edition to our product range, the CPA5000 Reference Preamplifier. The CPA5000 builds on the already advanced CPA4000 with the latest Ultra High Frequency power supply and ultra low noise circuitry giving an amazing noise floor performance below -130dB. 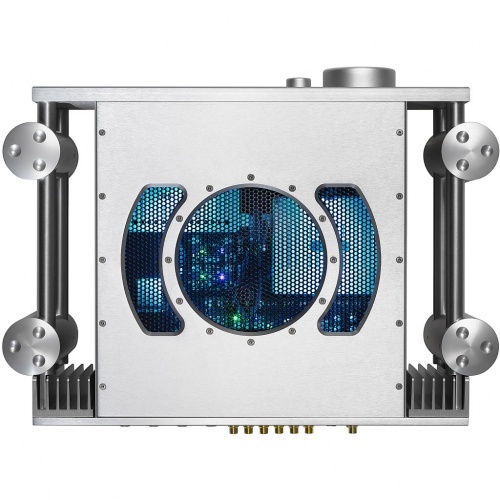 It also utilises solid milled aluminium shielding to prevent RF interference. Extra flexibility is now offered with four pairs of fully balanced XLR style inputs and an additional four pairs of RCA style unbalanced inputs with two completely independent tape/recording loops. Selection can be made manually via the front panel or using the supplied remote control. Each input has six levels of gain that can be individually selected to prevent large changes in volume when switching between inputs. All settings are stored via the microprocessor even if power is removed. 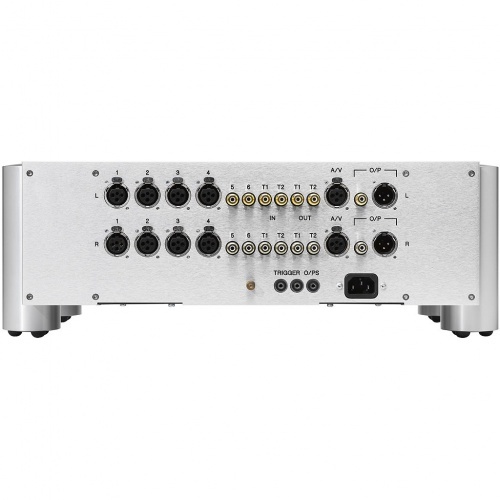 Not only can the CPA5000 be used in a traditional stereo setup but fully balanced AV Bypass circuitry will allow direct connection to an AV processor at full signal level routing the signal directly from input to output avoiding the volume control. 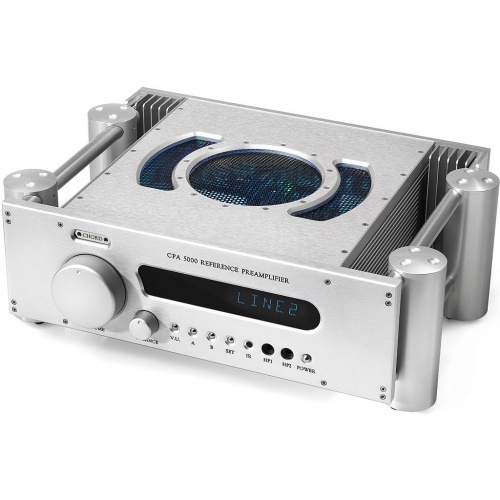 This gives a truly flexible system for the purest two channel stereo reproduction converting for use in a multichannel AV system with a simple press of a switch. Signal detection indicators have been replaced with highly accurate visually stunning VU meters incorporated into the front panel display. 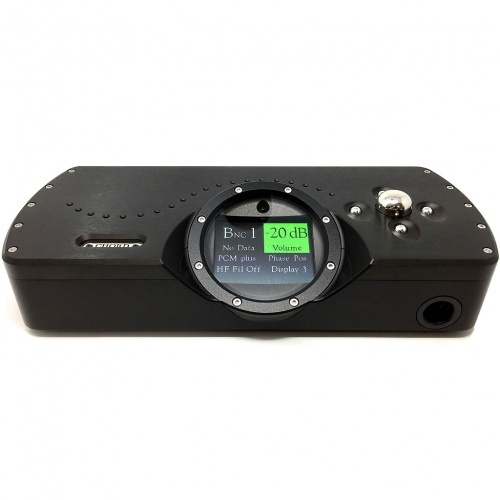 These give both clear signal detection and accurate input level. Naturally these may be selected or disabled as required. Headphone connectivity has been retained with two low distortion, low noise headphone output jack socket easily accessible on the front panel. 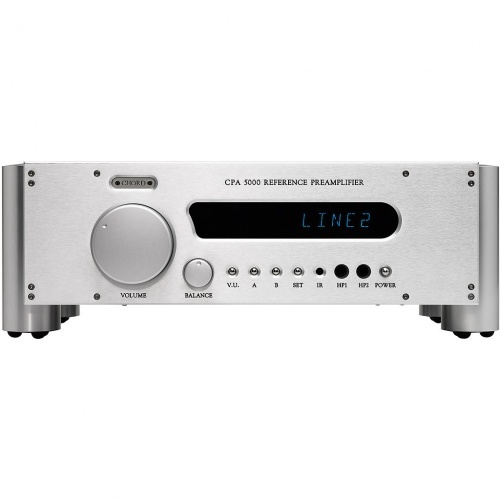 Remote triggering outputs are available at the rear of the unit to activate power amplifiers or AV processors as soon as you press the aluminium power switch on the front of the CPA5000. As with all Chord products each piece of metal work is machined from solid aluminium giving a superb rigid construction that gives unsurpassed vibration damping with stunning looks to match. The CPA5000 builds on the already advanced CPA4000 with the latest Ultra High Frequency power supply and ultra low noise circuitry giving an amazing noise floor performance below -130dB. 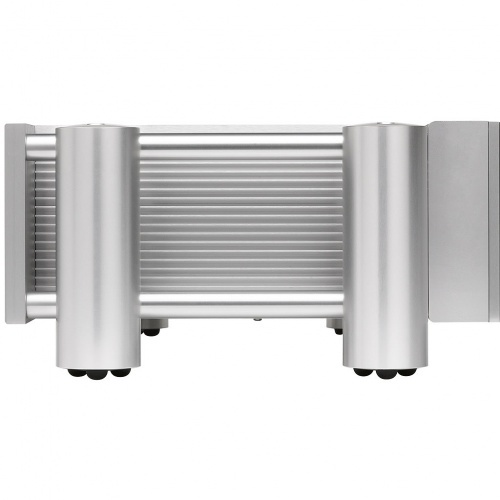 It also utilises solid milled aluminium shielding to prevent RF interference. Four pairs of fully balanced XLR style inputs, four pairs of RCA style unbalanced inputs including two completely independent tape/recording loops. Highly accurate visually stunning VU meters have been incorporated into the front panel display giving both clear signal detection and level. Naturally these may be selected or disabled as required. A pair of AV Bypass inputs that are fully balanced to allow direct connection to an AV processor at full signal level. Two low distortion, low noise headphone outputs. Unbalanced Inputs: Line 5, Line 6, Tape 1, Tape 2. 4 x pairs RCA Phono style, gold-plated with Teflon dielectric insulation. Balanced Inputs: Line 1 to Line 4. 3-pin female pairs of female Neutrik XLR inputs. Outputs: 1 x pair of 3-pin male Neutrik XLR output with 1 x pair of gold-plated RCA Phono wired asymmetrically in parallel.